The 52-year-old was fired due to a really poor start to the season, after being in the job since April 2017. Willie Desjardins was named the interim coach. The Los Angeles Kings have been one of the worst teams in the whole NHL in this 2018-19 season. The Kings have a 4-8-1 record this season and are tied with the Florida Panthers for the bottom spot in the league with only 9 points. However, the Kings have played 13 games as opposed to the Panthers' 11. This poor form came as a shock to everyone, most of all Kings' fans who were expecting one more deep playoff run from their veteran core, especially with the free agency addition of Ilya Kovalchuk. 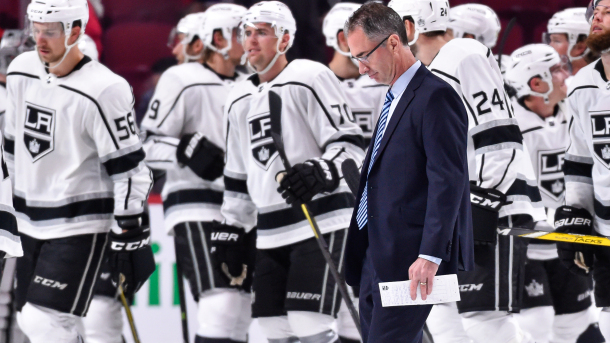 John Stevens started the job on April 23, 2017, replacing Darryl Sutter after serving as an assistant coach and then associate head coach since 2014. In his full season with the team, the Kings were a team with a strong defensive system, getting into the playoffs. The Kings were then swept by the Vegas Golden Knights on their inspired run to the Stanley Cup Final. The defensive system seems to have completely disappeared this season, conceding 3.46 goals per game on average this season. Perhaps the worst Kings' performance this season came at home against the New York Islanders. The Islanders destroyed the Kings 7-2, scoring four goals on four consecutive shots. On the ice, the L.A. Kings look slower, struggled with zone entries, and just do not seem like a scoring threat. General manager Rob Blake saw that he must act now for the Kings to have any chance of salvaging this season: “This is a critical time in our season and our results to date have fallen well below our expectations,” Blake said in a statement. “With that in mind, this was a difficult decision but one we feel was necessary." The Kings sit in the bottom spot of the Pacific division, eight points away from a wildcard spot. That is a lot of points to accumulate and teams to pass this early in the season, but the Kings have to believe, even though the window for their core of two-time Stanley Cup winners has already closed. Willie Desjardins has been named as the interim coach after Stevens' firing. Desjardins was the head coach of the Vancouver Canucks from 2014 to 2017 and also led Team Canada at the 2018 Winter Olympic Games in Pyeongchang. It is difficult to determine who could replace Stevens for the long-term, but as soon as rumors about the new Los Angeles Kings coach arise, they will be reported. What are your thoughts on the firing of head coach John Stevens? Do you think it is justified and it will help the team get out of the spiral dive they are experiencing? Let us know in the comment section below, and make sure to give us a follow on Twitter (@VAVELNHL_ENG) for more updates!